The Counties of Salt Lake and Davis have passed ordinances mandating the drinking water suppliers in those counties fluoridate the water supplied to their customers. As provided in State law (19-4-11) counties have authority to enact such ordinances if a majority of the voters, in an election in the area, approve the addition or removal of fluoride added to the drinking water. In both counties, an election was held and the voters approved the addition of fluoride. Consequently, both counties enacted ordinances and the Davis (604.57 KB) and Salt Lake (62 KB) county health departments promulgated regulations governing fluoridation. Manufacturers, transporters, and distributors of fluoride must supply copies of their NSF/ANSI (National Sanitation Foundation/American National Standards Institute) application to the Division of Drinking Water and the Salt Lake and Davis County Health Departments. A Certificate of Analysis for each batch of delivered fluoride must be furnished to the fluoridating water system. The Division of Drinking Water, Davis, and Salt Lake County Health Departments, must maintain and provide copies of the manufacturers’, transporters’, and distributors’ NSF/ANSI application to the requesting public (documents identified in item 1 above). Fluoridating water utilities in Davis and Salt Lake Counties must maintain and provide copies of the Certificate of Analysis to the requesting public (documents identified in item 2 above). If the above provisions listed in items 1 and 2 are not followed, the Salt Lake and Davis County Health Departments shall order the cessation of fluoride addition until the provisions are complied with. The following table lists the Manufacturers and Distributors that have submitted their NSF/ANSI Applications to the Division and local health departments. A link to those applications is also provided. Vendors not listed cannot supply fluoride to fluoridating water systems. *Mintchem product is supplied locally by TA Solutions in Salt Lake City. Because the product is not repackaged along the pathway to Salt Lake, ANSI/NSF standards are not applicable. Each Certificate of Analysis must include a measure of each of the above-identified parameters, even if the measured value is not detected. With the exception of Arsenic, all other chemical impurities were found in less than 3% of samples tested. In the case of Arsenic, 43% of samples tested detected its presence. These nine constituents must be included in the Certificate of Analysis provided to the fluoridating water system. The NSF is a recognized national authority on the safety of products used for the drinking water supply industry, among other fields. 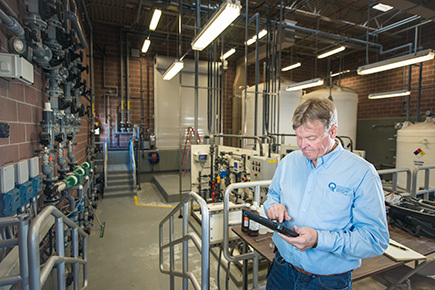 The Division of Drinking Water references NSF Standards throughout its Rules. The specific NSF Standard for purity of the fluoride supply is set forth in NSF/ANSI Standard 60. This specific standard addresses the purity of drinking water treatment chemicals, including fluoride. It assumes that the dosage rate will be 10 times the normal or optimal dosage rate and that the resulting concentration of the impurity will be less than 10% of the maximum, allowing concentration of that impurity in the delivered drinking water. Hence there is a safety factor of 100 inherent with the NSF/ANSI Standard. Suppliers of the fluoride chemical must, by State law, provide a Certificate of Analysis for each delivered batch of fluoride to the receiving water utility. The results of Arsenic, Barium, Cadmium Chromium, Copper, Lead, Mercury, Selenium, and Thallium reported in the Certificate of Analysis measure the concentration of these constituents as impurities in the concentrated fluoride supply. The concentrations of these constituents should not be compared to drinking water standards. This is because the concentrated fluoride and its impurities will be greatly diluted when added to the drinking water supply. The safety of the fluoride supply is regulated by the Division of Drinking Water. The Division uses the NSF/ANSI Standard 60 to determine compliance. To properly compare the concentration of the impurities in the Certificate of Analysis with the drinking water standards, or Maximum Contaminant Levels (MCL’s), one must know the dosage concentration of the added fluoride. Following are two tables that will help. The first table lists the drinking water standards or MCL’s for each of the constituents appearing on the Certificate of Analysis. Determine if the CoA results have been reported in units of mg/l or ug/l. Determine the dosage concentration of the fluoride chemical being added to achieve fluoridation. Typically this dosage concentration is between 0.8 mg/l and 1.2 mg/l. Multiply the appropriate dosage concentration factor (as found in the table below) by the parameter value reported in the CoA and compare the resultant calculation with the appropriate column in the MCL Table above. In comparing the resultant calculation with the above table, be sure to note the concentration in the CoA. It will be expressed in either parts per million (mg/1) or parts per billion (ug/l). For example, if the CoA expresses concentrations as parts per million (mg/l), compare the resultant calculation with the middle column in the MCL table. If the CoA expresses concentrations as parts per billion (ug/l), compare the resultant calculation with the far right column in the MCL table. A review of the Fluoride Drinking Water Standard by the EPA. Water fluoridation additives fact sheet from the Centers for Disease Control and Prevention. Frequently asked questions, hosted by the Salt Lake County Health Department. Community water fluoridation from the Centers for Disease Control and Prevention. Campaign for Dental Health site information of fluoride use.